Please note that the content of this book primarily consists of articles available from Wikipedia or other free sources online. The Wood-coloured Quaker (Apamea lignicolora) is a moth of Apamea antennata is a moth of the Noctuidae family. It is found in western North America, including California and British Columbia. This wingspan is about 45 mm. 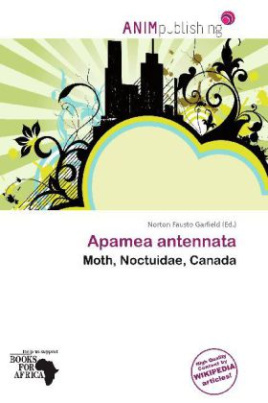 The moth flies from early to midsummer depending on the location.The larva feed on a various grasses.A moth is an insect closely related to the butterfly, both being of the order Lepidoptera. Moths form the majority of this order; there are thought to be 150,000 to 250,000 different species of moth (about ten times the number of species of butterfly), with thousands of species yet to be described.